The next time you think about grilling up some burgers, why not consider making one with fish? These salmon cakes are made with fresh salmon and seasoned with Dijon mustard, lemon, green onion, and herbs, offering something completely different—but absolutely delicious—at your next cookout. You may be more familiar with cooking salmon cakes on the stove or in the oven, but with some extra care and preparation, these fish cakes can be cooked on the grill. Feel free to serve them up burger style or plate them along with a salad. They would also be ideal with a side of grilled asparagus and a garlic-parsley pasta. Place salmon in a food processor. Blend until mixture is coarsely chopped. Transfer to a large bowl. Add breadcrumbs, mayonnaise, finely chopped green onion, chopped parsley, Dijon mustard, lemon zest and juice, salt, and black pepper. Gently mix until all ingredients are well combined. Shape salmon mixture into 8 equal-sized patties about 1/2 inch thick. Brush each patty with olive oil on both sides. Using a large pair of tongs and folded paper towel, oil grill grates very well. This will create a nice non-stick surface. Make at least 3 to 4 passes with the oiled towel. Place salmon cakes on the grill being careful to keep the cake together. Cook for 3 to 4 minutes per side, or until cooked through. Grill burger buns for your salmon cakes by first oiling the insides of hamburger buns and then placing them onto the grill, oiled-side down, to toast for two minutes. Remove the buns and assemble the burgers with toppings like sliced tomato and avocado, or a lemon-herb mayonnaise. 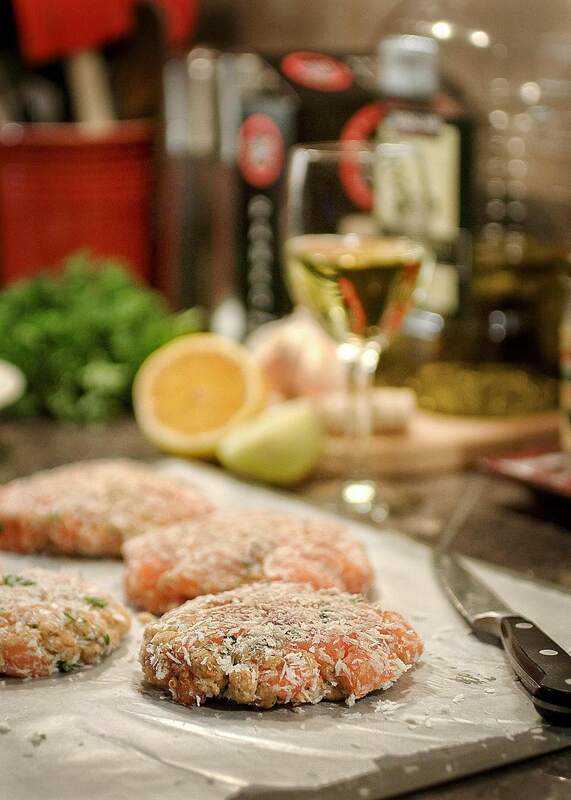 Place the salmon cakes on a baking sheet lined with wax paper and refrigerate for 30 minutes before grilling to assure they hold together. Note: Chilled cakes may take longer to cook, so factor this into the grilling time. Grill your salmon cakes on top of a grill pan or aluminum foil to assure they don't fall through the grates. You won't get grill marks by cooking them this way, but you won't lose the burgers. How Do You Make Grilled Stuffed Salmon?